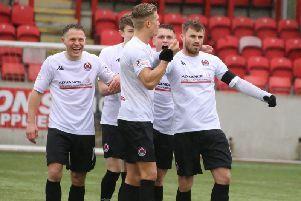 Kilsyth Rangers suffered yet another disappointing away result and performance on Saturday which has more or less ended their promotion hopes, reports John Ferguson. They went down 3-0 to a Whitletts Victoria side who leapfrog them in the table, despite being no more than an ordinary side who will be pleased to maintain their place in the Championship for another year. There was some doubt about the game going ahead initially after heavy rain but the referee made the decision to start and it relented soon after kick-off. There wasn’t much between the teams in the early exchanges with few decent openings being made, but neither keeper was seriously troubled. Rangers’ play was to adopt a close passing game but it continually broke down after just a few passes with the ball going to an opponent or out of play. Whitletts had a much more direct approach and they did get a few shots in, although David Tait easily dealt with what was on target. But with just a minute until the interval a good ball in was knocked out by Tait only for former Rangers player Adam Forsyth to nip in and put the home side one up. It was a very similar pattern of play from Rangers after the restart; they persisted in trying their tactics of trying to outplay Whitletts but very few real chances were made. And midway through the second half Jordan Baird added a second goal for Whitletts with a fine solo effort, finishing with a shot from just inside the penalty box.